Bangkok, if my opinion counts, is a great taxi city. I have no idea how many taxicabs and taxi drivers there are in Bangkok City. If anyone knows, let me know. I would like to know. One can read just about anything happening either in or near a Bangkok taxicab. Acts of kindness, births, rapes, murder and theft are just a few that come to mind. My experience with Bangkok taxicabs and their drivers has been mostly positive. Mostly, as in 90% positive. 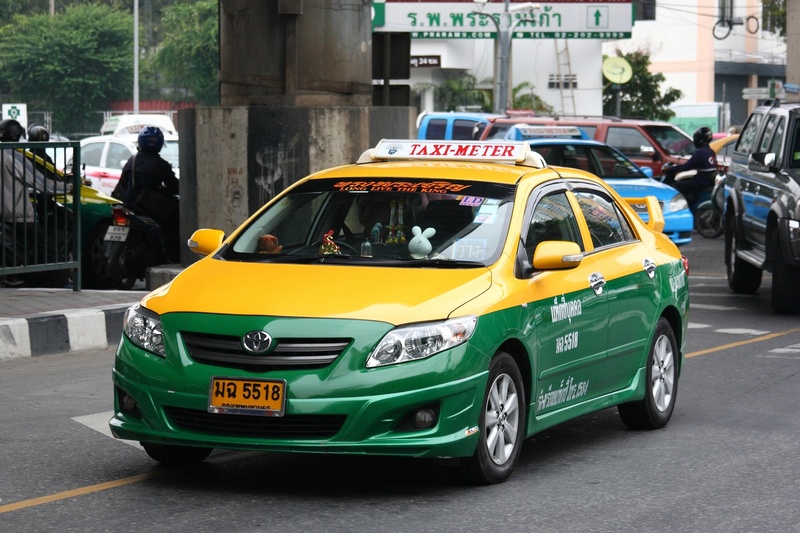 Bangkok taxicabs come in many colors: orange; pink; yellow; blue; white; and my personal favorite, the green and yellow. Many of the Bangkok taxi drivers are poor, Buddhist, from Isaan and friendly in my experience. I have my prejudices about them. I’m not keen on the pink ones, not because of the color, rather because of the drivers behind their steering wheels. I don’t mind older taxicabs and I prefer older taxi drivers, anytime. Older taxi drivers, in my experience, are far less likely to turn down your request for a ride and, if I had to wager, less likely to pull a four foot sword out of his trunk, when provoked. The fact that taxi drivers in Thailand can and do turn you down took some getting used to. It used to bother me. Bother me as in, it would get me royally pissed off ten years or more ago, when they did just that. Now I have adapted to the Thai, may pen rai, jai yen yen attitude. The above picture is of a taxi driver in a solid yellow taxicab that I took with my camera phone one day, while on the expressway. He has a great countenance, as many of them do. They spend 10-12 hours a day in the worst traffic imaginable and yet, by and large, they remain cool. There are of course exceptions as in the case of the American expat stabbed and killed by a taxi driver arguing over a $2.00 fare not long ago. 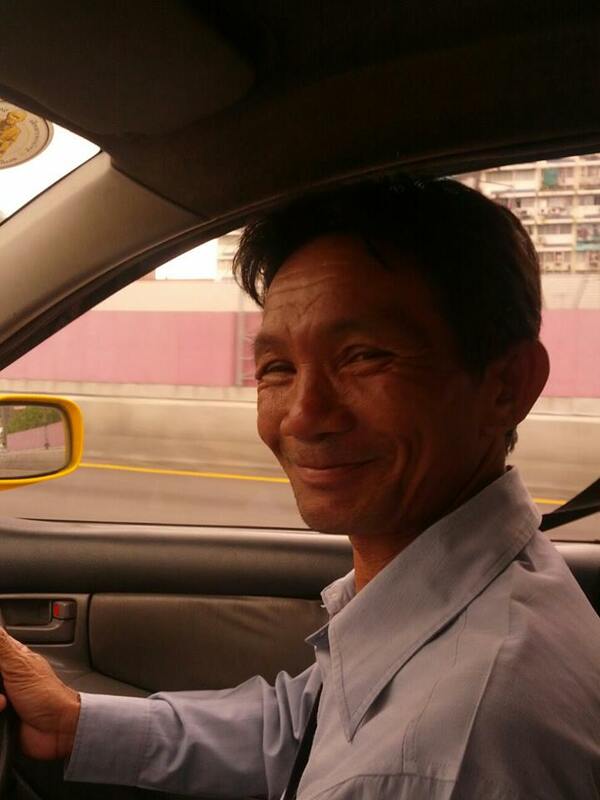 I had a favorite taxi driver in Bangkok, from the hundreds I have ridden with. His name was Mr. Khemsak. His business card is one of the few I keep in my wallet. I used him many, many times over the years. Over 50 and under 100 I would estimate. As a lone passenger, with my wife, my family and sometimes with visiting friends from America. Short trips and long ones. Fares that were baht 40 ($1.25) and baht 2,000 ($66.00). On his card are the words, “SERVICE MIND”. He had that. He also smiled a lot, was helpful and spoke pretty good English. He was a driver during the Viet Nam war era and shared many interesting stories. He has a daughter who received a University degree and he was very proud of her. 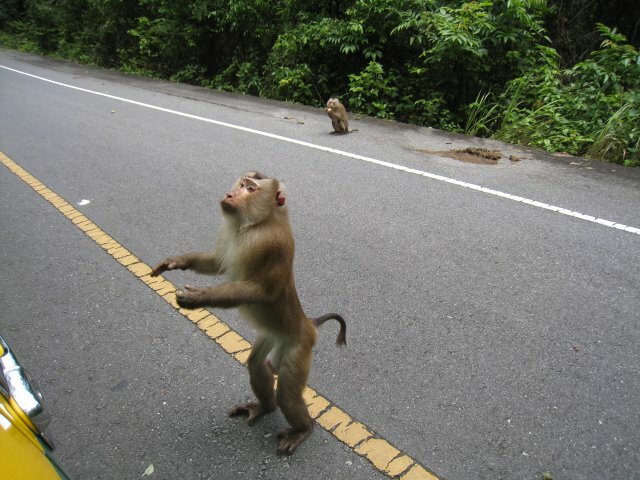 The above picture was taken by my wife, Ratree, from inside Mr. Khemsak’s green and yellow taxicab as we rode through Khao Yai National Park. We were returning from Chokchai Farms campgrounds where we had spent the previous night in a fancy tent. It was the morning of our 10 Year Wedding Anniversary. Mr. Khemsak had the good sense to buy some bananas prior to entering the park on our return trip. You can just make out the green and yellow colors of Mr. Khemsak’s taxicab in the picture. I have many pictures of Mr. Khemsak but they are all in my mind. Earlier that same day, a special day, as every day we are alive is, my wife and I ate a bowl of noodles at an outdoor restaurant surrounded by greenery, with Mr. Khemsak at the same table. 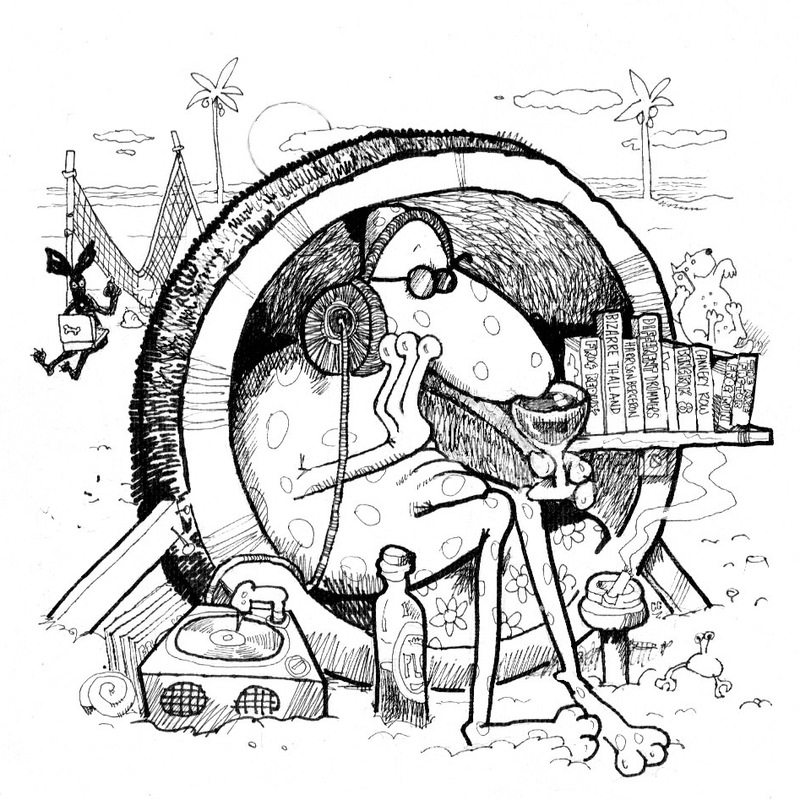 He often wanted to eat away from us, thinking perhaps (incorrectly) that he would be an intrusion to our privacy. On that day, our anniversary day, I insisted he eat with us. 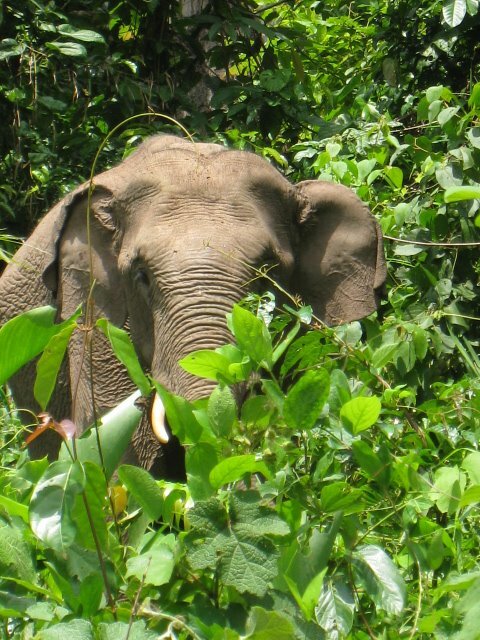 Later we would see the elephant in the above picture. We saw three elephants in the wild that day: the male, shown above, a female and their one offspring. I will always remember that day, which was less than 18 months ago and I hope I always remember and think about Mr. Khemsak from time to time. I suspect this post will help me do both. The last time my wife and I rode together with Mr. Khemsak was to Bang Saen and back. There was always a comfort level anytime he drove us. Recently Mr. Khemsak fell ill. I felt bad about this but was comforted with the fact that he had a caring daughter in his life and a wife of his own of many years. I spoke with him on the phone a few times after he was ill. Last week, I learned of his death. It was something I feared. It became a reality. A reality we all face one day. Mr. Khemsak faced his reality in his mid 60s. He wasn’t famous. He was far from rich. He owned some land outside Bangkok and he lived modestly within the city. He was humble and happy from what I saw. He liked his job as a Bangkok taxi driver and I believe the people he drove liked him. Mr. Khemsak left only favorable impressions upon me. How many people can you say that about? Not enough, to be sure. I am thankful for having known him on this magical mystery tour called life. Rest in peace, Mr. Khemsak. You left the world you touched a little better than you found it. We can all aspire to do that. Thank-you, Arthur. I will miss Mr. Khemsak. Rajiv, Tuk-Tuks are not my first choice of transportation, but I do like the fact they are around from time to time.